Face Art Magic was established in 2009 by Tina Erickson. 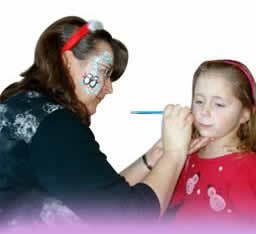 The business is fully licensed and insured and offers professional face painting services for parties and events. Please call 509.307.2539 for more information or to book your event. When you hire Face Art Magic, you are hiring a professional face painter to service your event. Unlike a volunteer face painter that you may find at fundraising/charity events who donates their time, I am a highly skilled artist who uses only professional face painting supplies and not those that may be found in a craft store. First, determine what your needs are for your event. How many people will want to be painted? How much time will be alotted for painting? A booking form must then be filled out and a non-refundable deposit is required to hold a date for your event. For your convenience, you may fill this form out online and pay the deposit using pay-pal or it may also be printed and filled in by hand and mailed. If you are mailing the form and deposit, please send at least 10 days in advance of your event date. There will be $30.00 charge for all returned checks. I will be dressed professionally and may add colorful shirts, hats and aprons depending on the event. I am not a clown and do not provide clown services. If you are having a theme party, I may be able match my outfit to the theme, but I do not work in costume. I will also have my own face painted, usually just a little design on one side. If you did not pay online, the remainder of your booking fee will be paid in full with cash the day of the event, before painting begins. If arranged for in advance, I can bring chairs, table, canopy, and all of my painting supplies, as well as idea books and boards for guests to look at. I will arrive 15-20 minutes before the start of your event to set up and be ready to paint when guests arrive. To ensure everyone planned for gets painted, there are a few things you can do to help speed up the line. they appear to be, they will not be painted against their wishes. hair pinned away from the face. If you are sick or appear to be sick, for sanitary reasons you will not be painted. I also can not paint on skin that has conditions or irritations. I may be able to paint something on an arm or hand. Know what design you want the painter to do. If this is a pay per face event, please have correct change. Paint is applied with sponges and brushes and dries in seconds. I also have glitter and shimmer powders that add an extra special touch to most designs. When the painting is finished, I show the person their face in a mirror. This is the best part of face painting for me, I love to see their smiles and their eyes light up. 15 minutes before the scheduled end time for the event I will close my face painting line. To do this, I will place a small dot of paint on the next three children in line and give the third child a sign that says "sorry, the face painting line is closed" or I will have a line manager to handle this. Face paint will last for hours. It will not crack and flake off, but should be washed off with mild soap and warm water before going to sleep. Face Painting? Is It Safe? my children. And, when I started face painting, I was concerned. information provided about the paint. line appears to be sick or has skin complaints, they will not be painted. not put me or their children in that situation. used and sanitary practices are in place. Some people like me, have very sensitive skin and even with the worlds safest products, allergic reactions can occur. fun and enjoy this colorful activity.